Lyon has been a flourishing trading city since Roman times. It owes that continuous prosperity to its strategic location at the confluence of the Rhône and Saône rivers. The city was known especially for the silk trade, but it also held important financial institutions and an early printing industry. 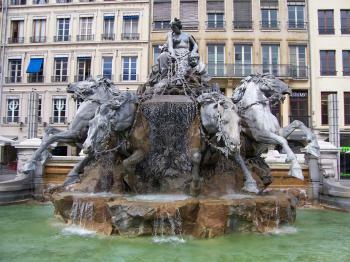 Lyon was founded as Lugdunum in 43 BC. Under Roman rule it was connected by a network of roads, and it even held the headquarters of the Imperial government. After the fall of the Roman Empire, Lyon subsequently became part of Lotharingia, Burgundy, the Holy Roman Empire and (the Kingdom of) France respectively. 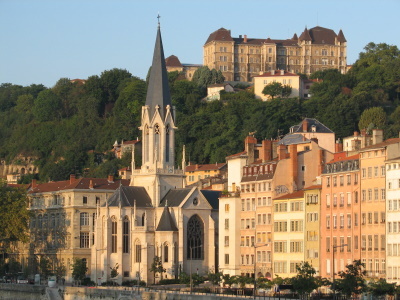 From the 16th century onwards the city expanded beyond its traditional quarters at the Croix-Rousse and Fourvière hills. The city of Lyon has enough on offer to satisfy anyone visiting for a weekend break. It’s a very lively ànd liveable city, with plenty of attractive restaurants, terraces, squares, small parks and (four) riverside(s). Because of the hills and the city’s size you’ll have to pack good walking shoes as you will easily set back several kilometres. On my first day here I explored the current city center and the Croix-Rousse hill. I immediately halted for lunch on one of the terraces at the square in front of the Hôtel de Ville. This is a great place, a bit like the market squares in Belgium. Then I walked on (and up) to the former silk workers neighbourhoods. Not a whole lot is left of that now, it’s mostly a residential area. One relatively small section still has terraced roads. The next day, a Sunday, I got started at 8 a.m. and made my way to the other hill: Fourvière. This part of the city, on the left bank of the Saône, feels more monumental than the area I walked in yesterday. Crossing the bridge your eyes immediately turn to the landmarks Fourvière Basilica and St. Jean Abbey. To get there it’s best to take the funicular railway. The service to Fourvière is suspended for the moment, so I had to take detour and walk from there. I passed the large Roman theatre and had a quick look. Most impressive however is the Fourvière Basilica. I am not that keen anymore on visiting churches and cathedrals, but this is a sight not to be missed. Its exterior is like a fairy tale castle, while the interior is full of large mosaics. Down at the foot of the hill is a neighbourhood called Vieux Lyon, where it is possible to see some of the old courtyards and passageways used by the silk workers (traboules). France’s nomination dossier for this site points out a large number of separate buildings within the historic area. I did have trouble finding a number of them – the city center is quite large (after all, Lyon has half a million inhabitants) and the monuments are sometimes a bit hidden between or behind shops and restaurants. Despite many times I have been to this region, I never have thought to visit Lyon’s historic center because my friends told me that there is nothing to see in this big city; however, when my friends and I decided to stop for a night at Lyon on our trip to Andorra because one of my friend want to have Lyonnais meal at his favorite restaurant, I decided to see this World Heritage Site city. Walking around in the area near its main train station, Part Dieu, Lyon really looked boring and nothing to see. When I crossed the Rhone to the old quarter, I started to see some nice buildings but nothing really outstanding, I went to see Place des Jacobins and Place Bellecour, again nothing special. I felt disappointed and almost decided to walk back to the hotel, but I thought that at least I should walk to the Saone. The beautiful view of Lyon along the Saone completely changed my mood, the sight of La Basilique Notre Dame de Fourvière on the green hill and the row of buildings of Vieux Lyon and La Croix-Rousse were something that made Lyon to be interesting than other French cities especially for La Croix-Rousse that I really impressed since it was really unique to see such kind of urban landscape in France, hilly and lack of organized city design. When I stepped into Vieux Lyon, it was a totally different world, full with narrow streets of Renaissance buildings, truly deserved to be the first place of France that has been protected under the famous Malraux Act. The area was beautiful, it did remind me the Gamla Stan in Stockholm or Italian medieval quarter. I also visit at least three unique “Traboule” which were quite fascinating for their design and funny that every time I came out from traboule, I always met a group of tourists who were reluctant to open the door as afraid to enter a private area. I spent a lot of time walking around Vieux Lyon and La Croix-Rousse and decided to skip Fourvière Basilica, something I always did to skip one highlight to make me want to revisit again. All in all Lyon is a really nice city, it may not have grand buildings or imposing squares like Paris, Toulouse or Bordeaux, but Lyon has its own characteristic that really charming and make it unique among other European cities. Actually if compared with Bordeaux, another French large city that its whole historical center is a World Heritage Site, these two cities are totally different while Bordeaux has many similarities with Paris with stately buildings, large squares, orderly row of buildings and large boulevards, Lyon rejected everything that Parisian love, I rarely find an orderly row of buildings in Lyon, each buildings has different design and height. Its square even in front of city hall has no gilded ornament to show wealth of the city. Lyon offers down to earth French city with more human touched and together with Lyonnaise cuisines, this World Heritage Site is truly a must visit. I visited this WHS in May 2015. I stayed in a lovely hotel in the Presqu'ile area which is an island of sorts between the Rhone and Saone rivers. It was a perfect base to visit all the different areas and sites of Lyon. The main landmark of Lyon and a great place to enjoy a great panoramic view of Lyon (as well as the numerous chimneys of the old city centre and Croix Rouge area) is the Fourviere Basilica easily reached by one of the world's two oldest funicular lines. The interior of the Basilica is worthwhile visiting and in the lower chapel there are beautiful mosaics of the capital vices as well as the Route of Santiago de Compostela (which I hope to embark on next year). The Fourviere hill is also the site of the original Roman Lugdunum and there is a Roman theatre and odeon with free entrance. I decided to walk down to the old city centre through the Roman theatre and odeon area. 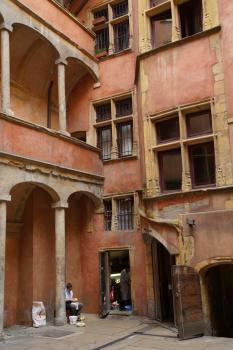 The highlight of my visit and the true OUV lies in the traboulles, the secret passageways and staircases of Lyon. I downloaded a set of maps and walking trails from www.lyontraboules.net and enjoyed getting lost in the traboulles network. Not all the doors were open all the time but I felt that this added more fun to my visit as every time I pushed the door knobs I didn't know what to expect and whether I would be able to pass through. The best time to visit, especially the traboulles in the old city centre, is definitely in the early morning or late evening/night time as towards 10am till sunset several tourist guides lead flocks of tourists and you won't be able to appreciate and experience the quiet enviroment and the locals' everyday life in the traboulles. Lyon is a beautiful metropolitan city with one of the largest open squares in the Europe, lovely fountains, good food and wine and a great place to spend a long weekend. The charm of Lyon is the lively atmosphere and the varied architecture from different periods, and moreover: interesting museums and an excellent local cuisine. What else could you want for a weekend trip? In Lyon, you can find historic districts and buildings representing traces of urban settlement from 2000 years, from the Roman period to modern times. We spent four days in Lyon in June 2013, the city was our base for visiting the Le Corbousier sites in Firminy and Eveux-sur-Arbresle and the starting point for our round trip through Southern France. The WHS spreads over a wide area and comprises the quarters of Croix-Rousse, Presqu’île, Vieux Lyon, and the Fourvière hill. We started exploring the city at the Croix-Rousse hill. The multi-storey houses are from the 19th Century and were the homes and workshops of the silk workers. The apartments have been specifically created for the silk weavers: high rooms with enough space for the looms and large windows for plenty of natural light. The view from a Saône bridge nicely shows the window front of the building ensemble upwards the Croix-Rousse hill. Today it's a lively neighbourhood with some fashionable shops and design workshops, eg in the Passage Thiaffait, but in other parts also with run-down houses and shabby corners. Just around the corner of our hotel was one of the most famous 'traboules' (passageways of the silk weavers): La Cour des Voraces (place Colbert 9) with a six-floor stairway in the courtyard. It was the refuge of the silk workers during the uprisings in the mid of the 19th Century. Other interesting places are the Montée de la Grande Côte, a street that leads from the Plateau de la Croix Rousse down to Presqu'ile, and the “Maison aux 365 fenêtres“ at the place Rouville, where you have also a nice view to the Fourvière Basilica. Vieux-Lyon, the oldest district in Lyon, is a network of paved streets and small squares, with picturesque Renaissance buildings, all connected by a second network of passageways and courtyards. It was great fun to explore these traboules. We had a printed map from LyonTraboules, but some of the indicated doors were closed (or we were unable to find the right entrance). Thus, very soon we gave up to follow the suggested route on the map. Instead, we followed the track of some of the many guided tours. The best examples of traboules are in the rue Juiverie, between rue Saint-Jean and rue de Gadagne, and - not to be missed - the Tour Rose with a huge spiral staircase in rue du Bouef no.16. Inevitably, the stroll through Vieux-Lyon ends at the Cathedral Saint-Jean. The interior is not very impressive, the most interesting is the astronomical clock. After a short lunch break (French 'fast food' at the Boulangerie du Palais), we went up to the Fourvière hill, and - sportsmanlike - we took the steep stairways at the end of rue du Bouef. 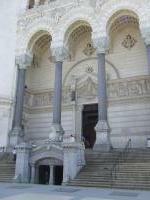 The Fourvière Basilica is unique in almost every respect and worth a visit. Ian's review aptly described the interior: "ludicrous" and "garish". Also worth seeing are the remains of the Roman theatres nearby, though they were less impressive than those we visited a few days later in Arles and Orange. It started to rain when we arrived there – lucky coincidence, because we decided to visit the Gallo-Roman Museum. From the outside rather inconspicuous, it turned out to be one of the best of its kind that I have ever visited. The highlights are the many large and well preserved mosaics. And finally: the Presqu'ile district between Rhône and Saône, with broad boulevards and wide squares, like the huge Place Bellecour or the Place des Terreaux. And you'll find shopping streets, restaurants (bouchons), and the ubiquitous traboules. The most beautiful examples: at the Musée de l'Imprimerie and in rue Mercière (photo). I would also confirm the recommendation by other reviewers for the Brasserie Georges, because of the Art Deco decoration and also because of the very good local food. If you have time left, there are fine examples of modern architecture in the outskirts of Lyon: the Gratte-Ciel neighbourhood with an Art-Deco town hall and theatre in Villeurbanne, the Saint-Exupéry TGV station by Santiago Calatrava, or buildings by Renzo Piano and Mario Botta. Maybe no must-see, but worthwhile if you are interested in modern architecture. And another attraction is under construction: the Musée Confluence by the Vienna architects Coop Himmelb(l)au (opening planned for 2014). 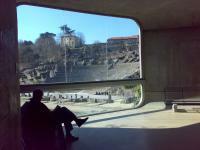 All in all, we spent enjoyable days in Lyon, it was a great prelude of our trip to Southern France. The historic centre of Lyon comprises a huge area in the city and shows the evolution of the place from the Roman time to the current days passing by the increasing presence of trade in the city expansion. One of the major places of the site are the Roman remains on Fourviere Hill and that comprise above all the Odeon, used for music, the theatre and several buildings that were composing a small town two millenniums ago. The museum located on the site is very well set up with huge collections of Roman artifacts and give a lot of explanations. 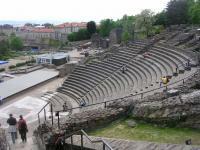 While visiting this place, give a look at the centre of the Odeon. You can see a great colorful mosaic made with different minerals from several places of the world known at this time. Relatively close from the Roman site, you will be able to admire the well-known Fourviere Cathedral, built at the end of the 19st century and unique by its shape and to enjoy one of the best views over Lyon. Taking the funicular to leave the hill, you will reach the Renaissance area and walk through the different buildings built by wealthy merchants several centuries ago. To finish with, the Presqu'île, the Peninsula over the river, is full of ancient building especially near of the Place Bellecour. As in Strasbourg, in Lyon I bought a day ticket which covered buses, trams, funicular, trolleybus and metro all for 4.50 euros. This way I managed to visit in one day the ornate Hotel de Ville, the sites on Fourviere Hill, the cathedral, several churches, the Temple and other architectural monuments and the huge Place Bellecour. Also interesting was the Embroidery Museum on the Presq'ile. 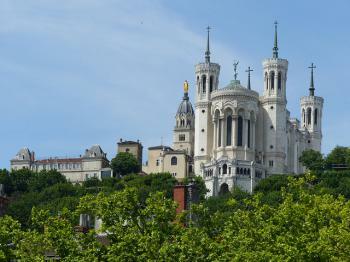 I’ve been to Lyon a couple of times but only on my last visit I had the time to go to the Fourvière hill. The view of the city from the back of the Basilica is magnificent (and the Basilica itself worth a visit even if it is only from the end of XIX century) but what I liked most was the Musèe de la Civilitation Gallo-Romaine in the complex of the Parc Archéologique de Lyon Fourvière where you can also visit for free the beautiful and well preserved Roman Theatres (Grand Théatre and Odéon). I had no idea that this museum had so many, big and wonderful mosaics! They reminded me of those in the Tunis museum, also there I was struck by these outstanding works dating from the Roman empire. You can reach the museum with a funicular railway to be taken near St. Jean Cathedral down in the Vieux Lyon (here, don’t miss to look inside the buildings), then a short walk just on the right, facing the Fourvière Basilica. I’ve also taken a look to the interesting Musée de Beaux Arts that houses one of France's richest collection of art masterpieces and been to the splendid Hotel de Ville where I had the chance to be invited to a gala dinner! Once I’ve also been to the famous Paul Bocuse’s “Abbaye of Collonges” at Collonges, 5km north outside the city of Lyon where there’s a incredible huge “carillon”. It’s a mechanical pipe organ dating 1900, whose sound is the equivalent of an orchestra of 110 musicians! You can eat there only for receptions, but you can experience his cuisine at the nearby Auberge. For cheaper and still good meals, head to Rue Mercière in Lyon, a pedestrian street where you can find several “bouchon” (authentically Lyonnais establishments). I also suggest Brasserie Georges near Perrache Station. Especially with children ask for the ‘Ile flottant’ dessert and wait for a special treatment! Hope to go again and visit the rest of the Fine Arts Museum and the Lumière Institute. I really enjoyed Lyon. It was the first proper visit I have paid to a major French city outside Paris, and gives a great impression of French culture. The Presqu’ile area, between the Saone and the Rhone, has broad boulevards and large public squares with some great buildings and fountains, including the very impressive fountain by Bartholdi (of Statue of Liberty fame) in front of the town hall. I also liked the printing museum in this area. The area of Old Lyon on the bank of the Saone is great, with a very impressive Cathedral and winding streets. These are all linked by Traboules; covered passages with fantastic spiral staircases. You will have to keep your eyes peeled to see them, and to get into many you have to press a buzzer but they are great fun to explore. There is a great example at the Printing Museum. Above this is the Fourviere area topped by basilica that can be seen from all around the city. It is comparable to Sacre Cour in Paris, however this has to be the most ludicrous place of worship I have visited. It is a double decker church. The lower tier is nice, however the top level is covered in very garish decorations, and really should not be missed. Nearby are the remains of the Roman theatres (Graeme’s photo below) I was surprised to find that these were actually free to enter and made a great place for a picnic. 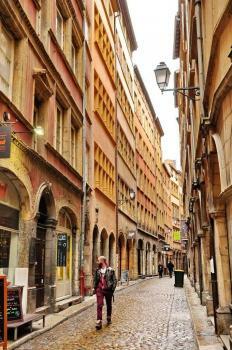 The area of old Lyon has some great restaurants. Bouchons are the authentically Lyonnias establishments, and we had a great meal in one of them. A severe warning to Vegetarians though; you will find the going very hard here. It took us about 30 minutes to find a place with a meat free dish, let alone menu, however the more carnivorous ones amongst us will be spoilt for choice. I can strongly recommend going down to Brasserie Georges near Perrache Station. It is a full blown Art Deco treat, a massive eating hall with no expense spared decoration. It also brews its own beers, a real treat. Lyon was a delight and gave me a great introduction to Metropolitan France outside Paris. Spent a weekend visiting a friend in Lyon in May 2005 and what a lovely city! Suffering from comparisons to Paris for centuries, I think Lyon wins out in many respects. The food, while simpler, is heartier and is served in the more comfortable confines of the local 'bouchon.' The people are generally more outgoing and more tolerant of those of us who make an attempt at speaking French. And finally, the city is a wonderfully eclectic array of elements, boasting Roman amphitheatres, medieval alleyways, grand palaces, and modern accoutrements, all gloriously straddling the confluence of the rivers Saone and Rhone. This is not to say that I do not like Paris,far from it, but for those seeking a more relaxed and, in some ways, authentic introduction to French urban life, Lyon should be the city of choice. Sieges and Battles: Besieged during the French Revolution. Aug/Sept 1783 at the order of the committee of Public Safety for counter revolutionary activities. French Republican forces laid siege and captured the city and followed up with its partial destruction and execution of many of its citizens. 327 Community Members have visited.